I must confess: As much as it pains me to pay full price for anything, I have not clipped a grocery coupon since my second son was born nine months ago. I know, I know. I went through my coupon folder last night and all but one had expired. But with triple coupons at Harris Teeter this week, I knew it was time to amend my backsliding ways. I organized the coupons I recently purchased from www.thecouponclippers.com and the stash of coupons I salvaged from products I've bought in the past few weeks and got them organized. My friend Courtney also told me about the printable coupons that are free online and I took advantage of some good ones. So, now I will brave HT during triple coupon days with a nine-month-old and four-year-old in tow...well, as soon as I get a shower and put on some eye makeup. Where do you get your coupons? Gotten any great deals this week at HT or elsewhere you want to brag about? It's okay, I get it. For printable coupons visit www.redplum.com www.coupons.com and www.coupons.smartsource.com. These empanadas remind me of the ones I had at a little stand in D.C. a few years ago. They have a sweet yet savory and spicy meat filling with a hearty whole wheat blend dough. Older kids will love them. They're a little time consuming, but you'll save time later since the recipe makes 8 and they freeze and reheat perfectly. To cut down on the prep time, I cooked extra ground beef when making taco salad earlier in the week. I set aside 1 lb of the meat, unseasoned for this recipe. And this dough is super easy to work with. Dough--pulse together in food processor until a soft dough forms. Knead dough 2-3 times on lightly floured surface, then roll into a ball, cut in half and then quarters. You should have 8 balls of dough. Cover with plastic wrap and let rest while you prepare the filling. When ready, roll out each ball into an 8" circle. Filling: Cook the beef and add all ingredients to the pan. Simmer until well blended. Remove from heat. Toss in cheese and cilantro once slightly cooled. Let filling cool. Divide between all eight dough circles. Brush water on one side of the dough and fold over. Seal with the tines of a fork. Brush each empanada you're going to bake then with eggwash. (I use a microwave safe bowl and set aside any excess egg to microwave for scrambled egg for the baby for dinner). Wrap the rest individually in plastic wrap and freeze in a gallon-sized freezer bag for later. Bake empanadas on a parchment lined pan at 400' for 35-40 minutes. Serve hot with a side salad. I remember getting our first VCR as a kid and, later, our first DVD player. They were huge and expensive. Now you can't even find a VCR in stores, and you can pick up a DVD player for $30 at Wal-Mart. But it was a red-letter day when we got a microwave. It took up an entire corner of the kitchen. I and my three siblings stood around in awe, taking turns wondering how it worked and what would happen if we microwaved various items--none of them food. Luckily that microwave lasted long enough to see the age of microwave popcorn. No more kettle on the stove. No more big yellow popcorn popper that never seemed to work quite right. We could open the box, unwrap the little white bag and in minutes we had hot, buttery popcorn. As an adult now, I have a son who takes the microwave and microwave popcorn for granted. Popcorn is Lincoln (and his Daddy's) favorite snack and one I don't mind indulging. 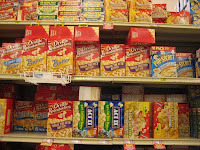 I almost forgot about that old yellow popcorn popper myself until I was standing in the snack aisle at the grocery store the other day, contemplating the microwave popcorn selection. Movie Theater butter. Well, that doesn't sound very good. Kettle Corn. Too much sugar. Light butter. Yeah, they'll spot that a mile away and it will sit on the shelf until it...does popcorn decompose? Grow sprouts? I tried reading the labels to help narrow my choice. Hydrogenated what? Diacetyl who? This synthetic butter has been linked to lung diseases in factory workers. If my kid is going to eat a bag of it a day I want to know what's in it, and I don't want to pay a fortune for it. The problem, in addition to content, is that half the regular-sized bag goes to waste and the selection of 100 calorie bags is even skimpier. When I'd spent a good three minutes staring at popcorn labels, I knew it was time for change. Being a good DIYer, I grabbed a 32 oz bag of popping corn for $1.50 and moved on. At home, I read the directions on the back of the bag, which called for 1/4 cup of oil in a pan and a 1/4 cup kernels. I cut it back to about 2 TB oil, just enough to coat the pan, turned on the gas, put in one kernel as per instructions, and covered the pan with a glass lid. Linc stood on a stool next to me and patiently watched the kernel. We could see it changing and when it popped, Linc laughed and clapped and gobbled it up. We put in the rest and watched them shoot around the pan like fireworks. Linc got out our popcorn cups (the big, red and white striped POPCORN servers you can get at Target in their $1 section). We melted a couple of TBs of Smart Balance spread, tossed it in with the popped corn, sprinkled it with sea salt and portioned it out. We had enough popcorn for 6 people, so next time will use less. Rich and I put Italian seasoning on ours (a garlic salt, herbs and pepper mix). The texture was crunchier but there were fewer of those kernels that get stuck in your teeth like microwave popcorn. I actually don't usually eat popcorn. I hate those kernels and it just doesn't taste good to me. But this I liked. Cost: Old fashioned popcorn--32 oz bag, 108 cups of popcorn, $1.57 bag. Or about $.01/cup (plus any expense of toppings, but since you keep salt and butter around anyway it's hard to calculate any added cost to you). Microwave popcorn--8 bags, 80 cups of popcorn, around $5.00 a box. Or about $.05/cup. Does anyone else see the irony in this return to the essentials? We have a technology that is supposed to make our lives simpler and we end up going back to the original way we did things. Don't get me wrong, this isn't a sweeping national craze, just our family. And the microwave stays and we still eat microwave popcorn. But it's a whole lot of fun and a lot healthier to eat popcorn the old fashioned way. There are a baffling number of these books. 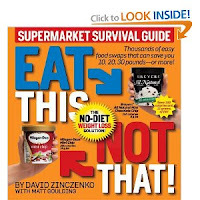 The supermarket guide. The restaurant guide. The cookbook. The book for kids. They vary in content some but mostly in focus. A friend in my MOPS group recommended them so I checked three of them out of the library. Upside: User friendly with pictures of products I find in my grocery store. And it's realistic to how the average family eats, with like comparisons. You can make many small changes to how you eat without the fam noticing. Also, good illustrations of otherwise dull numbers. Did you know that one jar of Snapple iced tea has the same amount of sugar as six fudgecicles? Downside: It can be hard to find what you're looking for when you want to refer back to it. And the suggested items might be "healthier" than other options, but that doesn't make it health food. Overall, really helpful. Lincoln, my oldest, and I both have issues with low blood sugar. Pre-mealtime at our house can be precarious. We're learning to anticipate our hunger needs and snacking smarter. And now we've realized that for us it starts with the right breakfast. We've traded whole-grain cereals with soy milk, pancakes or waffles, and even oatmeal for high protein foods. And what a difference! I've noticed a huge improvement in Lincoln's moods and ability to handle disappointments throughout the morning. I would chalk it up to him getting older, except that I've noticed a big improvement for myself as well. So, what does breakfast look like? Whole grain toast with natural peanut butter and honey. Eggs. Coffee for mom. And most days a yogurt fruit smoothie. Sounds like a lot of food, but I've found I eat less the rest of the day when I take time to eat a (humongous) breakfast. Nursing Benjamin and running help me burn the calories. As I wean him, I'll have to adjust my calorie intake, but I also won't be so hungry. Here's a recipe for a healthy, filling smoothie that even Lincoln loves. For an extra boost, I toss in a couple tablespoons of one of Ben's baby food veggie/fruit blends before I feed him breakfast. This morning I used squash/peach. Linc didn't even notice. And at $.46 for a jar of baby food it's a quick, cheap, easy way to add more veg to our diets. Add to blender. Blend. Pour. Enjoy! When my husband and I agreed that I would stay home after the birth of our first son, Lincoln, a part of the reason was food. Seriously. I knew that with two of us working full-time and commuting 45 minutes to an hour for work every day the first thing that would go would be healthy, homemade meals. Our health and our waistlines would pay the price. So good food is a priority for our family. Now that said, I don't shop my week's worth of groceries at Whole Foods or even Trader Joe's. The closest health food store is 25 minutes away and with a four-year-old and a nine-month-old I'm lucky to find two hours to hit Wal-Mart for groceries and household items once a week. To be completely transparent, I don't even buy organic produce. I'm just too cheap. I figure it's better to eat a lot of fruits and vegetables that aren't organic but are affordable than to eat less produce that's probably less fresh because it moves slower off the shelves at my local grocery store. If there's an organic option that's slightly more expensive or similar in price, I'll choose the organic option. And there are some natural or organic products that I just prefer like conditioners, body washes and lotions. But I don't buy hook, line and sinker into the whole organic movement. So what is this blog about? We are an average family of four. We try to live a balanced life and eat well-balanced foods within a balanced budget. We eat mostly lean meats, whole grains and lots of fruits and veggies. But I also like to bake, and when I bake I use butter. Because one cookie that tastes good beats the heck out of three that taste like cardboard. The trick, of course, is stopping at one. :-) This blog is about our journey to find ways to eat well, save money and enjoy life with our friends and family.